Keep your favorite hobby close at hand with these beautiful Coloring Calendars for Adults. The problem with Coloring Calendars for me is keeping up, so go ahead and get started on your 2018 calendars now so you are ready for the new year. I’m SO excited about this first coloring calendar to share. Thie Illustrator Leila Duly has released her second coloring book to the market this year and added in this coloring calendar. Her botanical illustrations are just ridiculously luscious. I am sure you will love it! Leila Duly’s botanical drawings are magical, I’ve shared several colorings from her original book on my social media accounts and would love to see yours. Use #coloringbookaddict so we’ll be sure to see it. Click to order the Coloring Calendar Amazon US UK & Canada here. Johanna Basford is always the first to start a trend and coloring calendars are no different. Here are her 2018 Coloring Calendars. 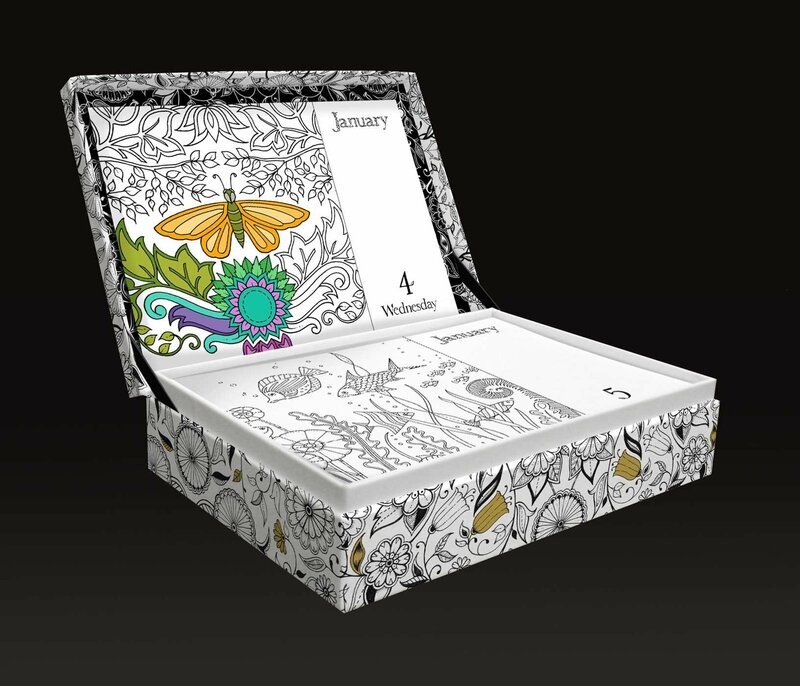 This day to day coloring calendar features images from 5 of Johanna’s books (doesn’t include Ivy & the Inky Butterfly yet) The keepsake box displays the current day’s page and provides a place to store the pages once they’re colored or to save them for later. I just received this datebook at our coloring groups holiday gift exchange and it is by far my favorite with selections of Johanna’s coloring books on each day, with the smaller format allowing you to finish in a short amount of time. Each image is printed on one side with the dates on the other so you can use markers on these too. This one is new to the market in 2018 but shares several of the pictures in the Amazon listing. It looks fantastic. Lang Wall Calendars have been around for years and always a favorite. There are several styles of coloring calendars this year to choose from. A Hebrew Illuminations 16-month calendar by Jewish artist Adam Rhine who has created intricate Judaic motifs such as Magen Davids and menorahs for you to color in. You can explore other Jewish Coloring Books here.